In everyday life we must often reach decisions while knowing that the outcome will not only depend on our own choice, but also on the choices of others. These situations are the focus of epistemic game theory. 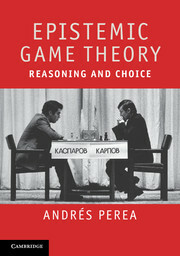 Unlike classical game theory, it explores how people may reason about their opponents before they make their final choice in a game. Packed with examples and practical problems based on stories from everyday life, this is the first textbook to explain the principles of epistemic game theory. Each chapter is dedicated to one particular, natural way of reasoning. The book then shows how each of these ways of reasoning will affect the final choices that can rationally be made and how these choices can be found by iterative procedures. Moreover, it does so in a way that uses elementary mathematics and does not presuppose any previous knowledge of game theory.